PRODUCT DESCRIPTION: A clear liquid which is sprayed where there is a pet urine or feces odor. 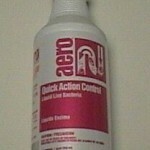 Well suited for small jobs, Quick Action is a "ready to use" spray meaning no mixing is needed. Like our more concentrated odor control products, Quick Action will literally "eat" the odor molecules and in doing so, removes the terrible smell associated with dogs and cats when they defecate on carpets, wood floors, basements and furniture. Works on cat scenting as well. WHERE TO USE IT: Just about anywhere a pet has gone where you want to remove the odor. Test it on sensitive fabric and surfaces ahead of time in case of a reaction. RATE OF APPLICATION: As much as needed. Second treatment may be necessary in some cases. A quart will cover up to 200 sq/ft; gallons will cover up to 800 sq/ft. I am trying to get rid of cat urine in a crawl space (2 feet) between floors (ceiling of utility room/stray cat stayed 2 days). I hope "fogging" is a viable option. Is this product used for that application? What are directions for use? Thank You. 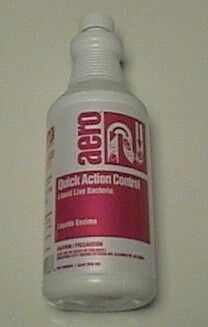 Quick Action can be used if the area is small (because its ready to use and not a concentrate). Though you say this crawl space is 2 feet, you were unclear as to the total square footage and this is important. So for example, if the area you need to treat is 20 feet wide by 20 feet long, you'd have 400 sq/ft of ground surface area. But since the "top" or ceiling of this space will be absorbing odor, it too needs to be sprayed. So all told, there would be a good 800-900 sq/ft in an area that measures 20' wide x 20' long x 2' high. And to treat an area this size, you'll need to use a full gallon of the Quick Action per application. So since it will many times take at least 2 applications to get rid of an odor like cat urine and feces, I would say you would expect to need at least 2 gallons of Quick Action to insure the odor is knocked out for good. So if in fact you have a space that's close to the "example size" above, a better product to use would be NNZ. It's highly concentrated and will go a lot further so in the long run, it's a lot more cost effective compared to Quick Action. NNZ is mixed at the rate of 12 oz per gallon of water and will cover up to 800 sq/ft of surface area per gallon of mixed solution. So if your crawl space has around 600-800 sq/ft of surface area to cover, the NNZ would be the more cost effective option for your problem. Lastly, you can apply either Quick Action or NNZ using any standard Pump Sprayer. But really the best way to use it is to fog. Our Mini Fogger will easily do the job (these work great for fogging around the yard to control flying pests like mosquitoes, gnats, biting flies, noseeums, etc.). But we also rent a unit that you get to "keep" for up to 2 weeks and then send back if you don't want to own one. Situation/Question: I have two elderly dachshunds who urinate and defecate on the unsealed brick floor of their 4'X10' dogroom nightly. I have tried several different enzymatic cleaners that give soooooome relief, but not complete. First, I pour diluted enzyme on the floor before I use a Hoover Floormate machine to dispense and remove the cleaner each day, but it smells HORRIBLE anyway. I certainly don't want to jeopardize the health of my dogs with a hazardous product; do you think any of your products will be appropriate/safe for my use? (They also have accidents on my carpet from time to time.) HELP!!!! Get some of our NNz. We have been selling this product for over 10 years and I'm certain it will help your problem. To use it, add 8 oz of NNz to a gallon of water and spray it out over the concrete flooring your "dog room" using any standard pump sprayer. Next, let it soak into the brick. Allow it to dry before walking over the treated area. Mind you letting it dry is not for safety reasons but rather to allow the enzyme to complete its job without being disrupted. I'm certain the odor issue is deep in the flooring and for this reason letting the NNz soak in will really help your cause. That being said, I expect you'll see instant results and after 2-3 applications, a huge improvement. NNz can be used safely on carpets, concrete and even outside on the grass. That's right, it doesn't pose a hazard to plants or grass and won't have any impact on your pets or other family members (other than removing malodor and making the air they breathe all the more healthier!). NNz is commonly used for dead body odor, smoke odor following a fire and feces/urine smells so rest assured, its tried and true and we are confident it will help your cause too. Remember, you'll need a good pump sprayer to apply it and after its applied, allow it to dry "naturally". In other words, don't use your Hoover to dispense it; let it lie and soak in.